This story begins back in August 2016, when a retired Priest from Arizona reached out to Savio to see if there would be any interest in receiving a Relic of St. Dominic Savio. The Priest contacted the Director of Campus Ministry, Mr. Chris Ochoa, and said he had a Relic with documentation from Rome approving the Relic of St. Dominic Savio as authentic. "I would like to entrust it [the Relic] to an institution where it will be respected. After seeing the presentation of your school on the internet, I called your school’s office and was told you would accept it, and so I’m sending it to you. May St. Dominic Savio bless your work and your high school." 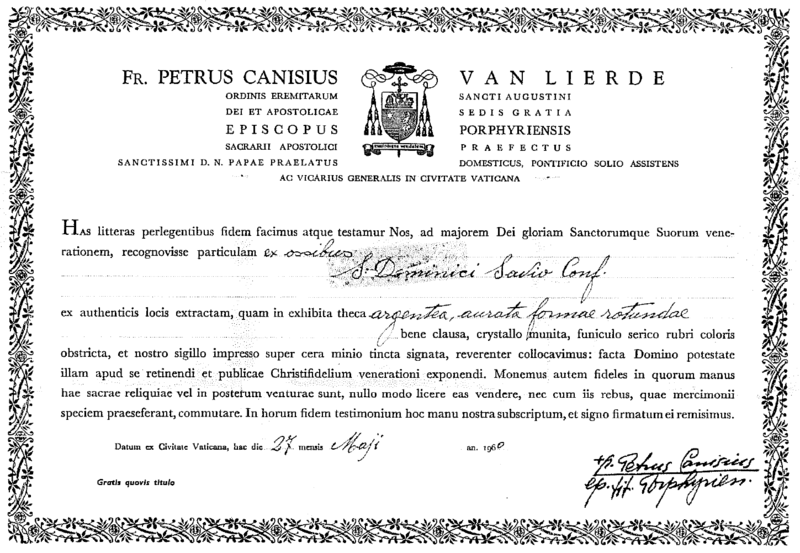 Along with the Relic, the Priest included the official documentation the Vatican from May 27, 1960 declaring the Relic as the remains of St. Dominic Savio. We make these letters with scrutiny’s of its faith and we bear witness, for the greater glory of God and the veneration of His Saints, to have recognized the particle from the bones of St. Dominic Savio conf., furnished from authentic body parts, which exhibited in a silver case, gilded of a round shape, well closed, protected with crystal, tied by a slender silken rope of a red color, and signed with our sigil imprinted above the wax dyed with vermillion, we have collected reverently: with power made for the sake of retaining it among yourselves and for the sake of display for the public veneration of Christians. 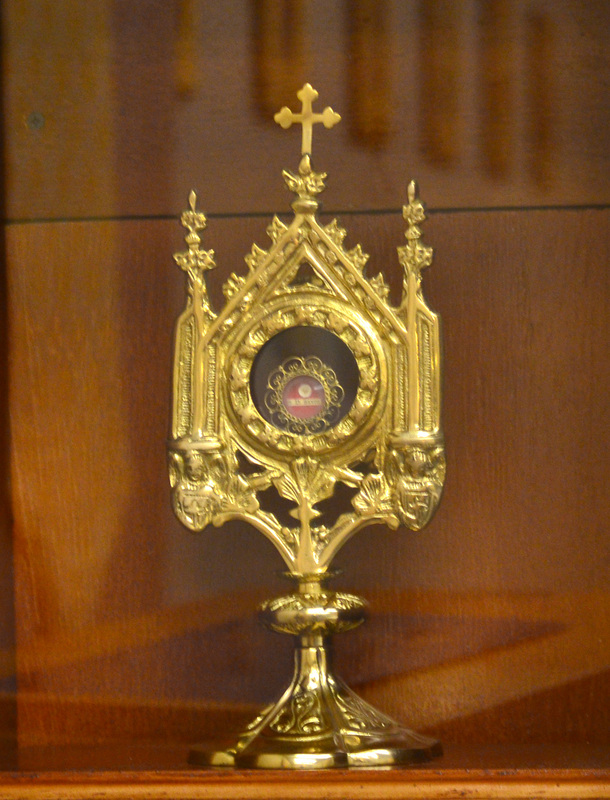 After receiving the Relic, school staff wrote to the Diocese of Austin to request permission to display the Relic publically. 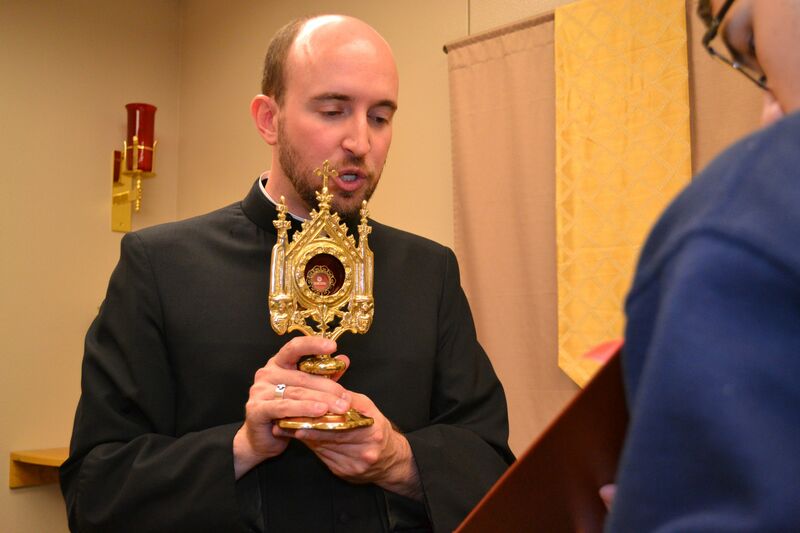 During the fall of 2016, permission was granted from Bishop Joe Vásquez to display the Relic in the school chapel. When summer arrived the St. Dominic Savio Facilities Director, Mr. Jonithan Pendergrass, started working on the display case. He built and designed the display case to be installed in the Savio school Chapel. On Friday, June 23, 2016, the display case was finished and installed to hold a relic of St. Dominic Savio. Mr. Pendergrass built the display case out of wood with a thick protective glass that allows viewing and provides a permanent memorial that now resides in the school Chapel. The case is a beautiful example of his custom carpentry and design abilities.Students, faculty and staff are welcome to visit the chapel and pray in front of the relic during regular school hours. 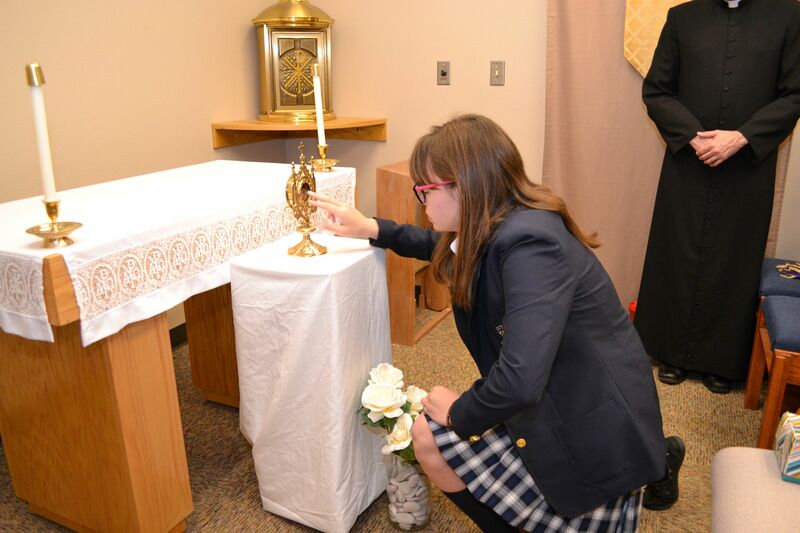 The relic is a reminder to the community that St. Dominic Savio was a real person and it is possible to pray with our school intercessor. If you would like to visit the relic and are not a Savio student or parent, please contact the front office for visiting hours and additional visiting information. Fr. Jonathan Raia installs the relic of St. Dominic Savio in the school chapel. "I need nothing in this world in order to be happy. I only need to see Jesus in heaven, whom I now see and adore on the altar with the eyes of faith."